The PHOENIX DIXIELAND JAZZ BAND is to be our band for you tonight (Friday, 3rd August 2018) here at FARNBOROUGH JAZZ CLUB (Kent). 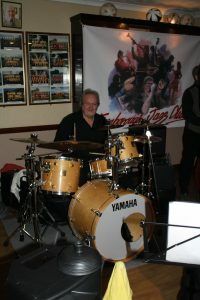 Robin Coombs was their original band leader, but he had a life-threatening illness a few years ago, which although has recovered from, actually made him decide to retire. Robin has been a close friend of Keith’s since their teenage years. Drummer, Alan Clarke carried on running the band without Robin, in the hope he would return, but when Robin decided to stop, they continued on. So that is with musicians PAUL HIGGS (iridescent trumpet), CHARLES SHERWOOD (clarinet), BILL TODD (trombone/voc), ALAN CLARKE (drums), ROGER CURPHEY (double bass) and pianist ALAN BERRY, Alan was for many years with that jazz programme ‘The Jazz Club’ on BBC Radio, (now Radio 2). They make a super line-up and have enjoyed continued success ever since. It’s another lovely warm sunny day today, which I think will bring us a gorgeous evening, once again. So lets see you all again for another week of jazz …. Your hosts – Diane and Keith. 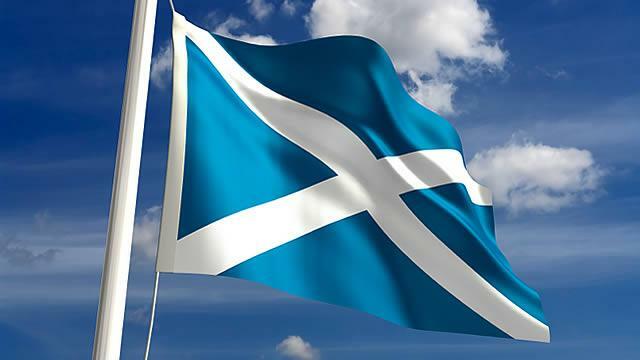 This entry was posted in Phoenix Dixieland Jazz Band on August 3, 2018 by Diane. Here are a couple of photos taken by Alan Walker and kindly sent to us for the website – thanks Alan. I will try to return with a small write-up at a later date – Di. This entry was posted in Phoenix Dixieland Jazz Band on February 27, 2018 by Diane. 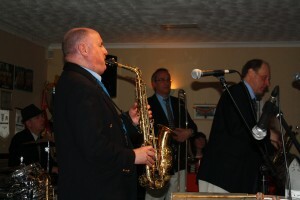 Phoenix Dixieland Jazz Band at Farnborough Jazz Club, Kent. Xmas party on 15th December 2017. 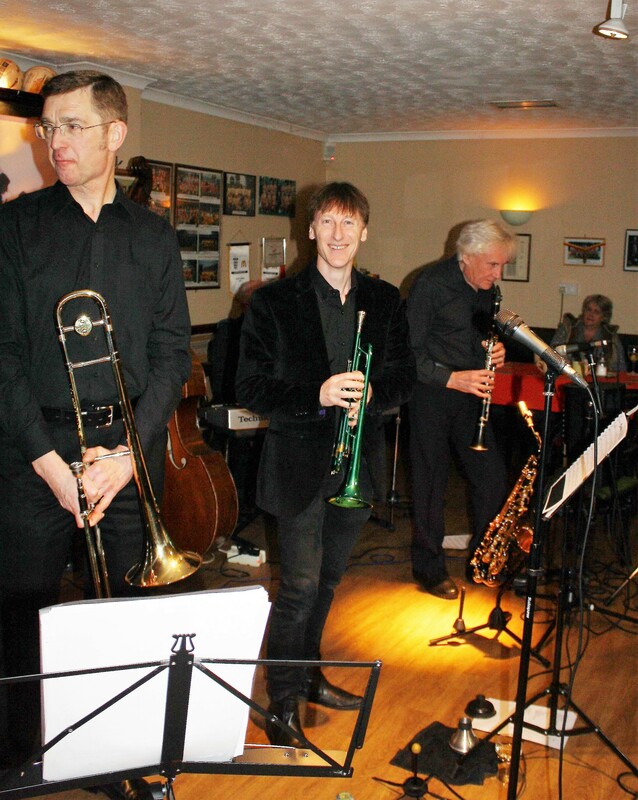 Paul Higgs (trumpet), Charles Sherwood (clarinet), Bill Todd (trombone), Dave Barnes (piano), Roger Curphey (d.bass) and Alan Clarke (drums). Photo by Mike Witt. The PHOENIX DIXIELAND JAZZ BAND, as Brucie (Sir Bruce Forsyth) would say, ‘you are our favourite’ at FARNBOROUGH JAZZ CLUB (well one of them, ha). They and are here this Friday 23th February 2018. The musicians will be PAUL HIGGS (iridescent trumpet), CHARLES SHERWOOD (clarinet), BILL TODD (trombone/voc), ALAN CLARKE (drums), ROGER CURPHEY (double bass) and this time, pianist ALAN BERRY. Alan has played with many greats. 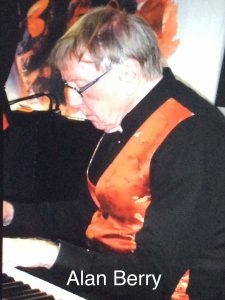 For many years, he worked with the jazz programme ‘The Jazz Club’ on BBC Radio (now Radio 2). Be prepared to hear some fabulous jazz and I know you’ll leave with a big smile on your face. This entry was posted in Phoenix Dixieland Jazz Band on February 22, 2018 by Diane. 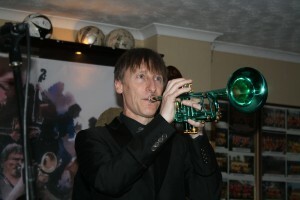 Paul Higgs playing his lovely iridescent green trumpet playing for Phoenix Dixieland Jazz Band here at Farnborough Jazz Club on 22nd January 2016. Photo by Mike Witt. 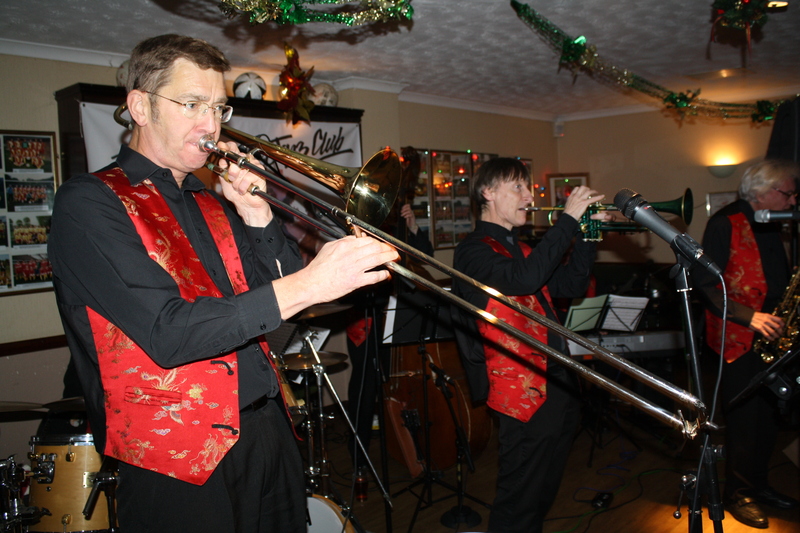 The PHOENIX DIXIELAND JAZZ BAND, bringing their wonderful ray of sunshine, will be here at the FARNBOROUGH JAZZ CLUB this Friday 15th December 2017. PAUL HIGGS will be playing his iridescent trumpet as magically as ever for us and joining him will be CHARLES SHERWOOD, playing clarinet, with BILL TODD playing trombone &vocals, ALAN CLARKE playing drums, DAVE BARNES playing piano & vocals and ROGER CURPHEY playing double bass. They present a wonderful program of exciting music for you, always something great to both listeners and dancers alike. Come and enjoy them, I’m sure you will not be disappointed . Besides, we have very nice Shepherd Neame bar staff too, plus a friendly atmosphere. This entry was posted in Phoenix Dixieland Jazz Band on December 13, 2017 by Diane. 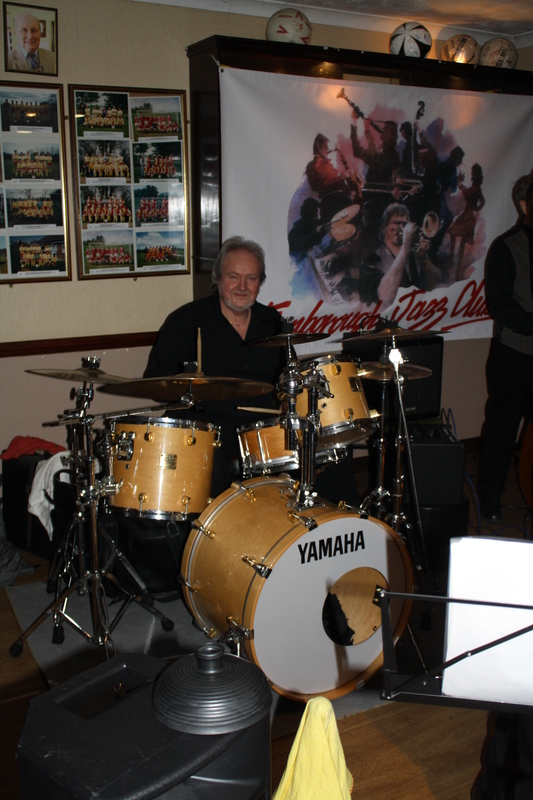 Lovely pic of John Ellmer on tenor sax at Farnborough Jazz Club (Kent) on 19th February 2016. Photo by Mike Witt. JOHN ELLMER will be playing his soprano sax as magically as ever for us tonight. That will be here at the FARNBOROUGH JAZZ CLUB tonight, Friday 20th October 2017. 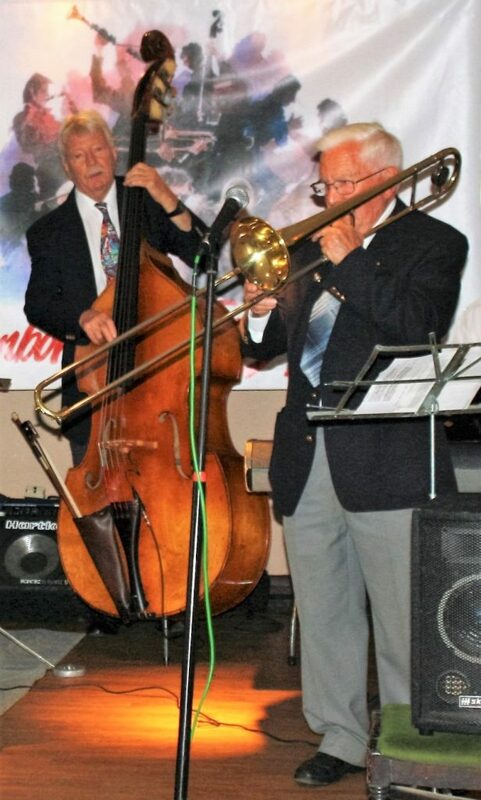 The rest of this fun filled PHOENIX DIXIELAND JAZZ BAND to join JOHN will be CHARLES SHERWOOD playing clarinet and BILL TODD playing trombone &vocals. 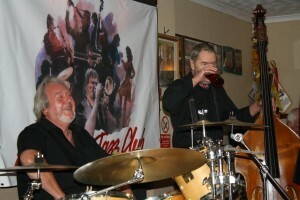 Also ALAN CLARKE playing drums, DAVE BARNES playing piano & vocals and ROGER CURPHEY playing double bass. So it would be very silly to miss them. Therefore, how about joining us at 8:00pm and set yourselves up for a happy weekend of tonight’s jazz memories. 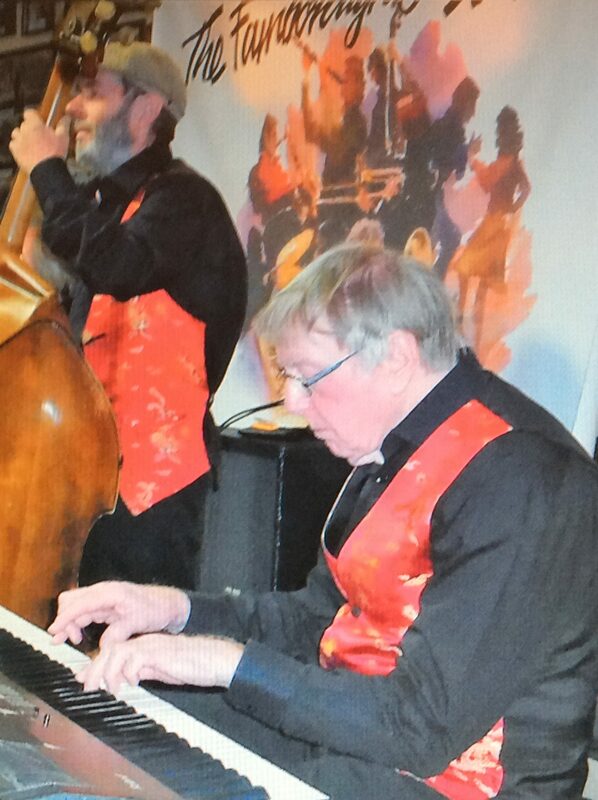 Dave also played piano at our wedding to entertain us all, whilst we were enjoying a drink in the main bar. This entry was posted in Phoenix Dixieland Jazz Band on October 20, 2017 by Diane. Bill Todd (trb) & Paul Higgs (trp) of Phoenix Dixieland Jazz Band play at Farnborough Jazz Club on 11th March 2016. Photo by Mike Witt. P.S. Why not come and enjoy a great Sunday lunch too (12.30-5:00) at ‘YE OLDE WHYTE LYON’ (tel: 01689-852631) and enjoy an afternoon of Smooth Jazz (3:00-6:00) with ‘4-IN-A-BAR+1’. The music’s free. 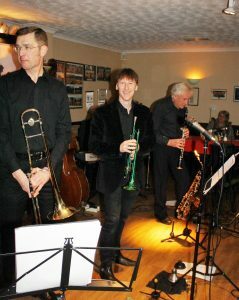 Playing are JOHN LEE (sax), TIM HUSKISSON (piano), ROGER CURPHEY (dbass), KEITH GRANT (drums) and Diane (‘+1’) (a few songs). Publican Tim has booked THIS Sunday 24th September 2017 & every last Sunday thereafter. Last time everyone loved the music, with many enjoying the new chef’s Sunday roast. This delightful Shepherd Neame pub (dated 1626) is situated in Locks Bottom, BR6 8NE, next door to Sainsbury’s & PRU Hospital. Sainsbury’ parking has changed on Sundays £2 ‘til 4:00pm (refundable for goods in Sainsbury’s, who close at 4pm) . There is a walk-thru to pub at far right corner (face Sainsbury’s). By the way, Shepherd Neame is the oldest brewery in the Country. That’s why (I’m told) the beers so good. This entry was posted in Phoenix Dixieland Jazz Band on September 22, 2017 by Diane. 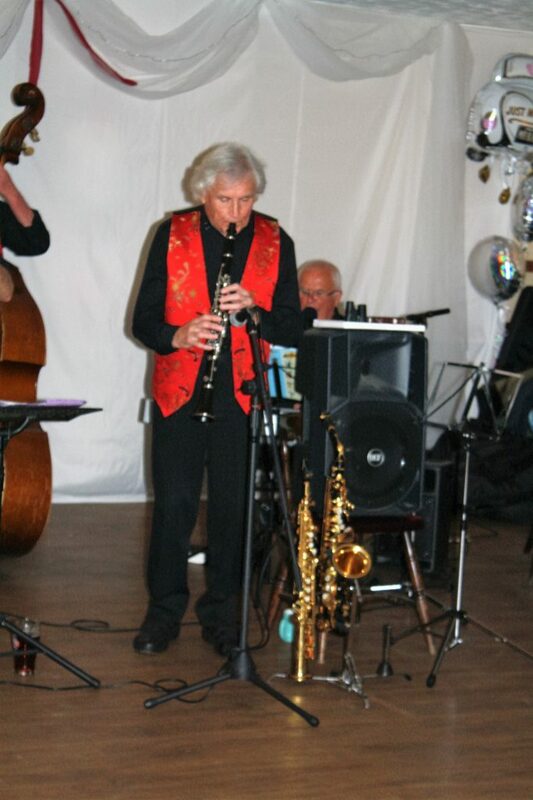 Alan Clarke of Phoenix Dixieland Jazz Band, plays at Farnborough Jazz Club on11 March 2016. Photo by Mike Witt. The PHOENIX DIXIELAND JAZZ BAND consists of a lovely lot of musicians for your enjoyment, namely super talented guest star MIKE COTTON on trumpet, with sweet playing CHARLES SHERWOOD on clarinet and brill BILL TODD on trombone & vocals, with fabulous drumming man ALAN CLARKE, plus our super-duper DAVE BARNES on piano & vocals, with ROGER CURPHEY – I’m not going to say too much about him – he will only get to big for his boots, but he plays double bass and hey I suppose that goes for our big JOHN STEWART – too, he’s on banjo & guitar. Anyway, we have them here again at the FARNBOROUGH JAZZ CLUB this Friday 5th May 2017, so make your way here without fail for this great seven-piece jazz band. By the by, so sorry I left half-way through last week’s fabulous band from Holland. It was horrible to hear how absolutely great they were throughout and to have missed out, especially the drum solo. I knew we were to be given that treat. 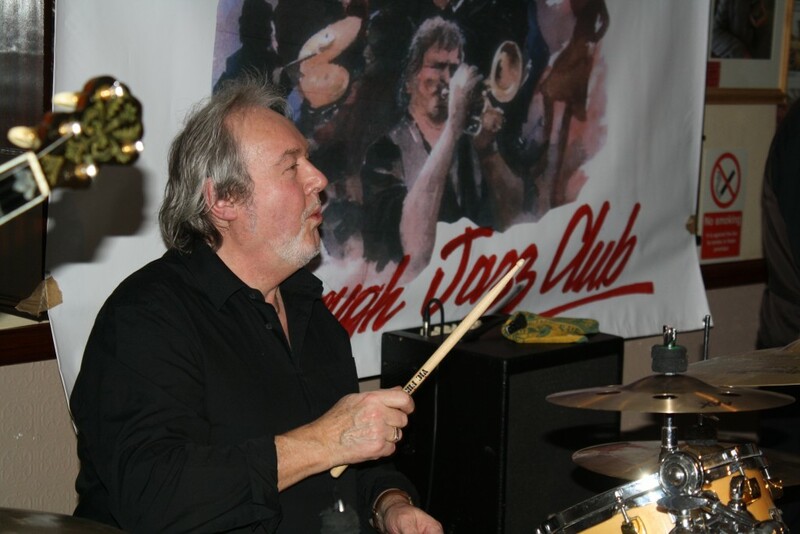 However, this week, Alan will be terrific too on Friday, he is an amazing drummer as well. He is a fine teacher (see attached, Alan playing ‘Take Five’ – accompanied by a beautifully elegant Linda King on piano). Thanks to everybody for taking my place, dealing with the raffle tickets – Steve and Susan on the ‘mike’. I don’t know exactly what was wrong with me last Friday, just felt very ill, but thanks for the many phone calls/texts enquiring after me and will see you all this Friday. This entry was posted in Phoenix Dixieland Jazz Band on May 3, 2017 by Diane. 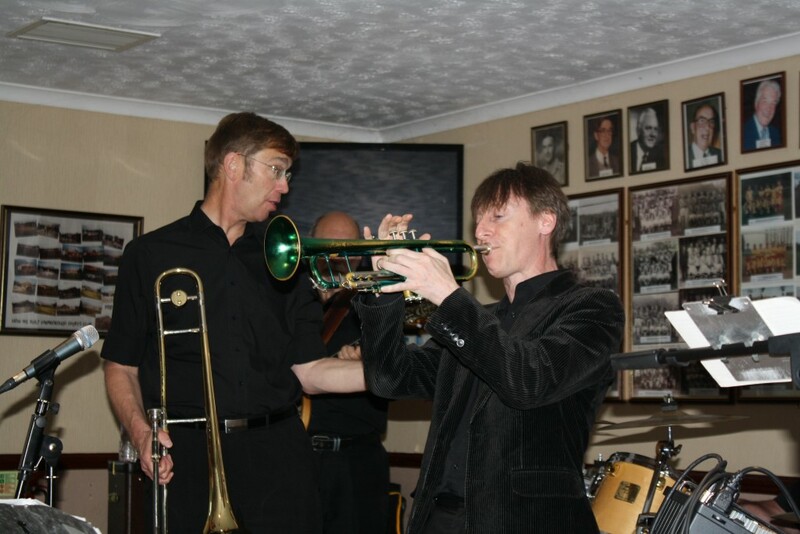 Bill Todd, Paul Higgs & Charles Sherwood enjoy playing with Phoenix Dixieland Jazz Band at Farnborough Jazz Club on 11 March 2016. Photo by Mike Witt. It’s our Christmas party-time already, here at the FARNBOROUGH JAZZ CLUB this Friday 23rd December 2016. 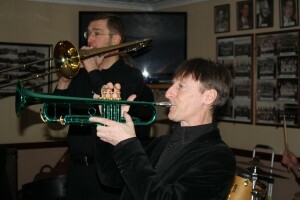 The PHOENIX DIXIELAND JAZZ BAND will be supplying the music for us. Those super guys in the band will be PAUL HIGGS on trumpet, CHARLES SHERWOOD on clarinet and BILL TODD on trombone &vocals, plus ALAN CLARKE on drums. Then there’s DAVE BARNES on piano & vocals, with ROGER CURPHEY on double bass, plus JOHN STEWART on banjo& guitar. Everyone is welcome and you don’t have to be a member. Just bring a great big smile with you and a feeling of good cheer to join in the fun. We will be having a fancy dress evening with no particular theme (although optional of course), a brolly parade and lots of raffle prizes too. The entrance fee is £15. You can bring your own food – and candelabras if you wish. Come and join us to some wonderful ‘live’ music. It will be our last jazz evening of the year, not returning until my birthday celebration on 13th January 2017. So Keith and I want to thank all the bands who have supported our jazz club over the years. Also, our lovely bar staff AND to audiences who maintain the lovely atmosphere we have. 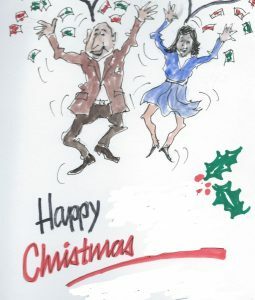 Here’s wishing you all A Very Merry Christmas and A Happy, Healthy and Prosperous New Year. This entry was posted in Phoenix Dixieland Jazz Band on December 19, 2016 by Diane.